…is like savoring a fine wine. The fullness and subtle complexities are noted and enjoyed. Each sip is oh-so satisfying. Years ago a friend commented on how much she preferred hunting over “older” bird dogs. I never thought to ask her why I just recall finding the comment interesting. At the time I didn’t have an “older” bird dog to hunt over. And, because I didn’t grow-up hunting my first exposure to hunting upland game with pointing dogs was in my 20s. At the time of her comment my own bird dogs, Vizslas, were young–none over 5 years. I’m not sure why her comment stuck with me all of this time. But it has. And occasionally it pops out for me to roll around in my thoughts and consider. Back when the comment was originally made, I do recall feeling as though I disagreed with her. After all, what could more exciting than watching the punchy movements of a young, agile bird dog? Who couldn’t enjoy watching the ground-speed of a confident pointing dog with a good nose? Their athletic grace, fire in the belly, and spark in the eye. That desire to find those birds…never failed to bring goosebumps to my arms. Hopefully, the phrase “with age comes maturity” proves true. Now, as I approach my 40s I have much more knowledge and experience under my hat. I still have much to learn but I’m so lucky to have hunted over some very talented pointing dogs—young and old. I’m also lucky to have developed friendships with so many others in this “bird dog world”. Like the bird dogs who have crossed my path, some of my friends are more mature than others. Some have more knowledge and experience than others. But I enjoy them all. Back to the “old guys”…I understand and agree with that comment now—about preferring to hunting over an “older” dog. Our first senior couldn’t really be considered a senior. At 8 years old he was often mistaken to be only 3 or 4 years old. The gray on his muzzle and legs was hardly noticeable when he was still and imperceptible when he was hunting. As an “older” dog he could hold his own just fine when in the field with a young whipper-snapper. He usually was into the birds first, with the youngins’ coming along many seconds after. He had the advantage of age. Because he had been hunted his entire life, that benefit brought so much knowledge about how to hunt different types of cover, how to use the winds, the differences in scent, how to track…and the most glorious of all—how to pin a moving bird. Talk about subtle complexities! 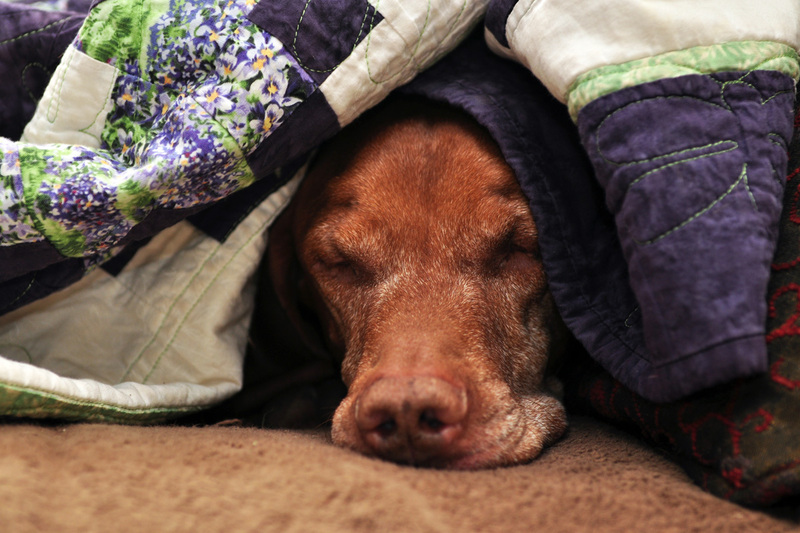 Devastatingly, we lost our first “senior” bird dog, a Vizsla, at just 9 years of age. He was in his prime. A lifetime of good care, optimal nutrition, and adoration helped him hold up just fine both physically and mentally while he was alive. For his entire life he was kept in great condition which enabled him to hunt comfortably and with endurance. He often outlasted younger dogs because they weren’t in as good of shape as he. But because I never thought of him as an “older” dog, I never thought of that comment when I hunted over him. Others who had hunted over him as a young dog and then later, as an older dog would compliment us on “how nicely” he’d come along and how they really enjoyed his training as a finished gun dog. His death brought the hugest of holes to my heart. A whole that will never be repaired. He loved life and was cheated out of many more years. We loved him and were robbed of many more years of hunting over him and of his companionship. So, what got me thinking about this comment about hunting over “older” bird dogs this time around? We just came out of the field having spent the day hunting over our “senior”/9 years old, our almost 5 year old, and our puppy who is almost a year old. Though I love watching the puppy learn how to use her nose, how to manage her youthful energy, how to handle hostile cover, my eyes would always drift back to my senior dog. Not only because I knew he was more likely to find the birds but because I was spellbound by the beauty of the scene he was painting before me. He moved with purpose, using only the energy he needed to reach out to hunt likely objectives. Mind you, he covers a lot of ground—just perfect for a gun dog. To watch him use the wind to locate and track bird-scent…never fails to satisfy. He would be moving with speed then—snap! He would turn directions on a dime and his posture would change. Tail ticking back and forth quickly, nose dropping as he tracked…my heart would race and I would adjust my shotgun getting ready. I was also so proud to watch him cast out, big and wide, covering ground in front of all guns in the field—paying us each due respect. “I’ll hunt the cover before you”, he said with his eyes as he passed by. This knowledge and respect for the teamwork part of hunting comes with maturity and experience. As a younger dog, he wasn’t comfortable enough to hunt for everyone in the field with him. He preferred to really only hunt for his “Pops” Aaron.